When adding attributes to airports, airfields, helicopter pads, or airport terminals, follow these rules. When entering the item type, you must observe the mapping rules concerning items that are forbidden to draw on YME. Air transport items are named in accordance with the general rules. See 3.1.3.1. Types of names: General rules . When naming items, you must observe the mapping rules concerning attributes that are forbidden to display on YME. You should enter the item type in official and caption names. For example: Vnukovo Airport. You should enter the item type in official names of airfields, landing strips, and helicopter pads. For example: Yermolino Airfield. You “must” enter the names of airfields, landing strips, and helicopter pads in the for caption on map field. You should not, however, enter the item types there. For example: Ermolino. You can use parentheses in the names of airports and airfields where their use is necessary in order to properly identify the item (these are listed in the Aerodromes with parentheses in their names appendix). Enter the days of the week and times when the business or organization is open. For example: “Mon-Fri 9:00-20:00, Sat 10:00-18:00”. You must enter the airport's email address in the “Email address” field. You must enter the airport's phone number in the “Telephone” field. 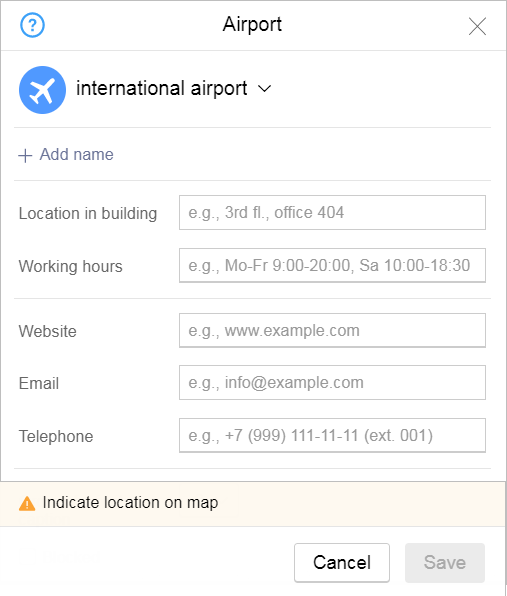 The Airport attribute indicates which airport a terminal belongs to. If the airport was drawn earlier, then you can choose its name from the list. If the airport was not drawn in earlier, then you must fill in the field manually (which creates a new airport).